1. 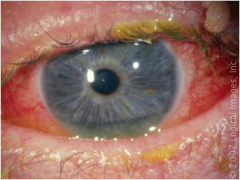 Granulomatous disorders: Syphilis, Tuberculosis, sarcoidosis, leprosy, brucellosis and toxoplasmosis may inflame either the front chamber (anterior uveitis/iritis) or back chamber. 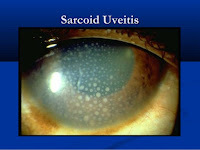 (posterior uveritis/choroiditis). 2. Systemic inflammatory diseases: may manifest in any part of the eye. 3. 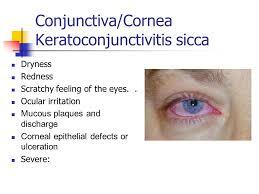 Keratoconjuctivitis sicca: is a reduction in tear formation. It causes gritty feeling in the eyes and a dry mouth (due to associated decreased saliva production). It is found on its own as in Sjogren syndrome or with other diseases like SLE, RA, sarcoidosis. It is tested by the Schirmer filter paper test (,5mm in 5 min) and treated by artificial tears. 4. 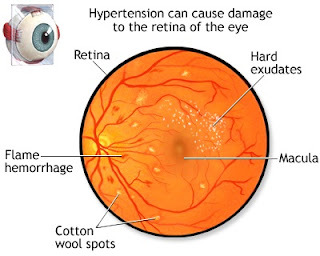 Hypertensive Retinopathy: Increased Blood pressure accelerates atherosclerosis in the retinal vessels. The hardened arteries are shiny (silver wiring) and nip veins where they cross ( AV nipping). Narrowed arterioles may become blocked causinglocalized retinal infarction seen as cotton wool spots. Leaks from these in severe hypertension manifest as hard exudates or macular edema. Papilloedema or flame hemorrhage suggest malignant hypertension requiring urgent treatment. 5. Vascular Occlusion: Emboli passing through retinal vasculture may cause retinal artery occlusion causing global or segmental retinal pallor. Roth spots are small retinal infarcts that occur in infective endocarditits. In dermatomyositis, there is orbital edema with retinopathy showing cotton wool spots. 6. Hematological disorders: Retinal hemorrhages occur in leukemia, comma shaped conjunctival hemorrhages and retinal new vessel formation may occur in sickle cell disease. Optic atropy is seen in pernicious anemia. Diabetes mellitus can lead to diabetic retinopathy and cataracts. Lens opacities are seen in hypoparathyroidism. Conjuctival and corneal calcifications can occur in hypercalcemia. In gout , conjuctival urate deposits may cause sore eyes. Septicemia may spread to vitreous causing endopthalmitis. 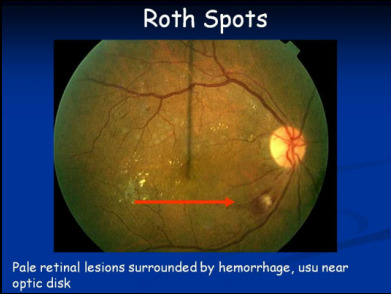 Syphilis can cause iritis (also pigmented retinopathy if congenital). Cotton wool spots on their own indicate HIV retinopathy. Kaposi sarcoma may affect the lids or conjunctiva.